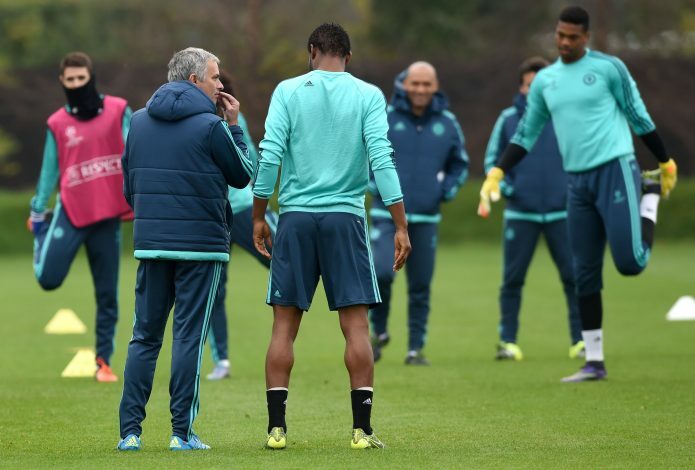 John Obi Mikel has opened up about the reasons that led to Jose Mourinho being sacked from his position as Chelsea manager. Mourinho returned to Chelsea in 2013 for a second spell at the club, and hoped to replicate the success he enjoyed in his first stint. He led Chelsea to 3rd in the Premier League standings in he 2013-14 season, finishing just four points behind champions Manchester City. The following season, the Blues went on to win the Premier League in emphatic fashion, losing just three matches in their entire campaign. Mourinho was awarded with the Manager of the Season award, and the romantic second coming to Stamford Bridge had its cherry on the icing of the cake. However, the love affair was short lived. Mourinho decided to give his players an extended holiday following their title triumph, but the decision backfired. Mikel has revealed how Chelsea’s stars returned to training unfit as a result of a short pre-season, and the club struggled in the league. By December, the reigning champions found themselves languishing just a point above the relegation zone, and Mourinho was sacked. Mikel admits that fitness issues played a part in their downfall under the Portuguese, but has confirmed that the players are a lot fitter this season. He also heaped praise onto Antonio Conte, who took over the club in the summer. Conte also put his stars through double-sessions in pre-season and changed their diets, and Mikel believes this is what made Chelsea go after the Italian. “[Double sessions] That’s the way he wants to train, that’s his style, that’s his way that he thinks we can win and that he thinks can get Chelsea back to where they belong,” he added. “Obviously, quite a lot was made last year that a lot of the players were not fit, so the club decided to go for someone to make sure we are fit. “The players have responded very well to him, we are going with whatever the manager wants to do in training, everyone is putting in their best and we have to keep going his way. “We have to make sure we keep doing whatever the manager wants to do and if we can improve the team that way then I think everybody is on board with that. “Well, I think we lost quite a lot of games in the previous pre-season. I think in this year’s pre-season, we didn’t lose as many games as we lost in the previous season under Mourinho. “I have never run as much, in any pre-season ever, as I ran and I think that is going to play a massive part. It is only going to help us through the season. I think when teams are getting tired, we are still going to be fit and that is only going to help and I think that is one of the major differences I can see.